I’m sure most people know Book Expo America, or BEA, was held last month in New York and many of you are probably tired of reading about it by now. Still, I was lucky enough to attend and wanted to get my two cents in. I’ll start with the events. The first event of the week for my roommate, Julie, and me was the Harper Collins Fall Preview. This is a fabulous event where publicist from each of Harper’s imprints share the upcoming books they’re the most excited about and explain why. Their excitement for the books is always contagious. Immediately after the Fall Preview, Harper Collins hosted a fun party where we got to mingle with publicists, other bloggers, and authors including Elyssa Friedland, Stephanie Evanovich, Tama Janowitz and Kimberly McCreight! On Thursday Julie and I decided to take a little time away from the trade show floor so we walked down to the Meatpacking district for breakfast and then walked The High Line to the Javits. 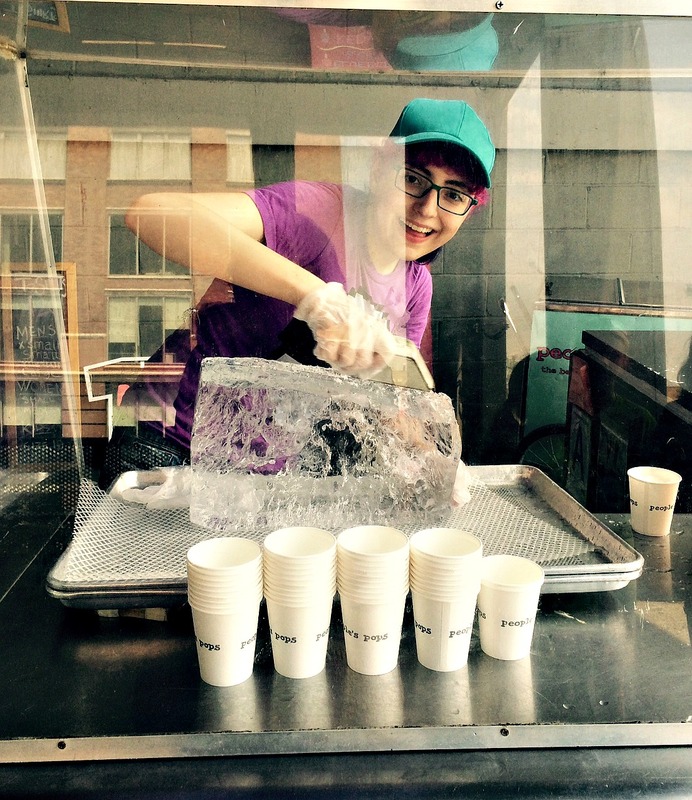 This adorable young lady made us a shaved ice (hand shaved!) that was delicious! After we got to the Javits, we met with a few publicists and walked the floor before calling it a day so we could go buy tickets to a play. We ended up seeing Something Rotten! which was a lot of fun for two bookish geeks! Friday morning started out with a breakfast with Scholastic – they had great food and authors, including David Baldacci, R. L. Stine, and Sonia Manzano. Manzano is Maria on Sesame Street and Julie was a total fan girl. After breakfast we walked the floor a little bit and met with a few more publicists. One of the highlights of BEA is the Book Group Speed Dating (hosted by The Book Report Network) event that took place Friday afternoon. At this event, you sit at a table and publicists come around talking about books they think are great for book club discussions. They highlight a great variety of books and even bring a few to share. After Speed Dating, Julie and I headed to Atria‘s Blogger Meet & Greet which was a lot of fun. 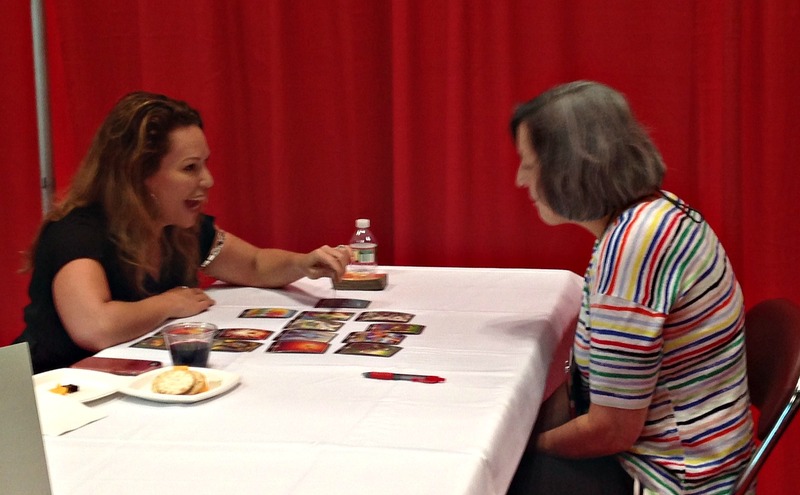 We met some great authors and wonderful publicists and Zhena Muzyka read the Tarot cards for me. I’m not sure if I believe in that stuff but what she had to say was pretty spot on. We ended the evening at another Broadway show – this time Hedwig and the Angry Inch. I thought it was good but not as good as Something Rotten. It was time to pack up and head home on Saturday morning which is always bittersweet for me. It was good to see you and Julie and you certainly made good use of your time here in NYC. I can’t wait to see Something Rotten. That’s great that you fit in some plays during your visit! And – meeting Kimberly McCreight sounds awesome! She has been really nice on Twitter and I loved her latest book! I also attended the Speed Dating session (this was my first year attending BEA), which I found really worthwhile and an efficient way to learn about new books! Sounds like such a fun time! How great that you were able to see two shows. I love Darren Criss who is the new Hedwig, so that would have been my favorite (based on being biased toward him) – LOL! Sounds like you had a great time! And I never get tired of hearing about BEA! Wow, that sounds like great fun. I have done the High Line when we visited our daughter in Brooklyn. And I just saw part of the Tony’s last night, and there was a song from Something Rotten. It looked good. I love Broadway almost as much as book world! Congrats on going. Hopefully next year I can get there. Sounds like you made the most of your time there. Thanks for sharing highlights with us. Something Rotten looks fabulous, can’t wait to enjoy it. Love hearing about everyone’s trip to BEA. Glad you had a good time. It’s always fun to read about your bookish experiences, Kathy, and this time is no different. I’ve actually heard very little about BEA this year. It sounds like you and Julie had a great time. What a fabulous time! I went last year for the first time and didn’t plan anything outside of BEA and wish I did! I love these recaps, especially since there is so much to see, and everyone always sees something different and has different experiences. It always sounds as though you do just the right things there. And…you don’t go over the top! 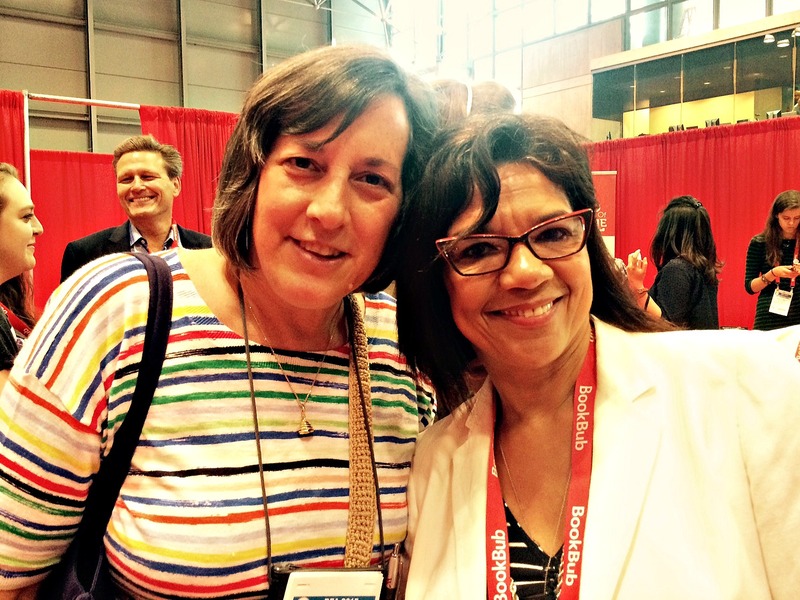 Looks like you both had a wonderful time in the city and at BEA. I’m glad you got to attend a lot of different events and had fun activities done! I love to live BEA vicariously thru you! How fun to go to those wonderful book events! Sounds like a great time. I love the High Line and Something Rotten sounds amazing! I do so like to live vicariously through all of you at BEA. Sounds really amazing. Kathy, I enjoyed reading about BEA and am glad that you enjoyed it so much. I wish I had been able to attend. It seems like a terrific annual event! I’m so glad you shared your trip with us. It sounds like the perfect trip for a couple of book nerd. It sounded like fun Kathy. Next year I hope to go to the BEA in Chicago! I didn’t hear that much about BEA, actually, because I was so busy with work stuff to be online much during BEA, so it’s great to read your recap! I should have tried to go this year, because I doubt I’ll get out to Chicago. But you never know! I’m glad we got to meet even if it was briefly at the Speed Dating session. My time at BEA was packed this year, but we did end up walking the High Line and visiting the Empire State building. I love the events you attended! They sound somewhat different from many of the BEA events I’ve read about in past years, or maybe I just feel that way. Glad you had fun! LOL! I must have been really embarrassing with Sonia Manzano if you even mentioned it here! Sounds like it was a lot of fun! Wish I would have been there to see you both. I wonder what next year will be like in Chicago? I was so sorry I had to miss the Atria event.